The critters around here at Dog Pawsitive Tidbits have spread their wings and are becoming quite the social butterflies! They are leaving a trail of paw prints far and wide. Funny how things like this happen sometimes. My friend Coletta and I were private messaging on Facebook about understanding dog talk. A bit later I visited the Blog Paws News Media page on Facebook and saw that it was F-A-C-E-B-O-O-K Friday. I wrote a note to myself to get a page set up for next week so I could participate. Shortly thereafter, the leader of the pack of my dogs barked a request, "We want our own Facebook fan page!" Well now, sometimes you bark and you shall receive. Yes, I bowed to the dog's bow-wow and Dog Pawsitive Tidbits Facebook Community page now exists. I figured, why wait? And you all know how impossible it is for a dog lover to refuse those fluttering puppy dog eyes! The dogs appreciated their new social digs on Facebook, but of course, they asked for more! They pointed out the fact that they had read my blog post about my newly created wrap and throw pillow for puppy NewBe. Oh! 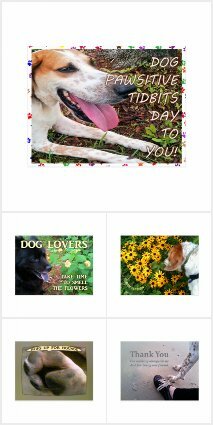 But I had put the items in my abitosunshine store at Zazzle and I was told with a bark or two that the dogs wanted their own store too! Guess what ... Dog Pawsitive Tidbits Zazzle store now exists! I barely had time to set up shop and create one product before it was time to write this article. I guess I know what I'll be designing all weekend! Do your dogs behave like social butterflies? 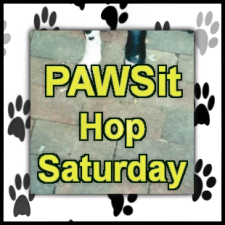 I hear one of my dogs barking in the background as I type, suggesting that you write a blog post about your social dogs and link it up with PAWSit Hop Saturday! Go ahead and grab the badge and link to this post so other dog lovers can join the blog hop fun too.